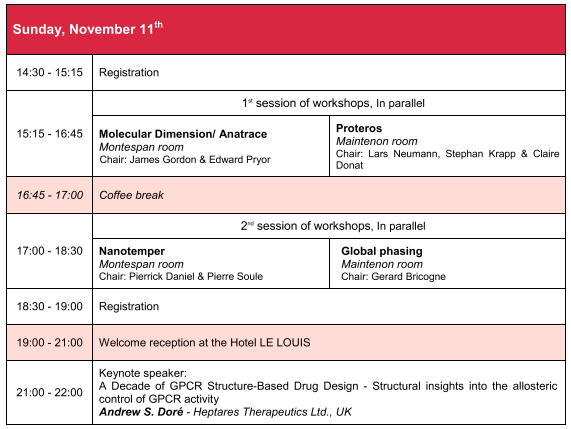 Accueil > Evenements > PSDI 2018 "26th Protein Structure Determination in Industry Meeting"
PSDI 2018 "26th Protein Structure Determination in Industry Meeting"
Au nom des organisateurs de PSDI et de son Comité exécutif, nous avons le plaisir de vous accueillir à la 26ème edition de la conference “Protein Structure Determination in Industry”, qui aura lieu à Versailles, en France, du dimanche 11 au mardi 13 novembre 2018. La conférence aura lieu à l'Hotel Le Louis Versailles Chateau à Versailles. Ce rendez-vous incontournable pour la communauté industrielle des biologistes structuraux sera cette année l'occasion de poursuivre l’échange sur les différentes techniques de biologie structurale intégrée. La conférence PSDI 2018 est conjointement organisée par le Synchrotron SOLEIL et SANOFI. Le dîner de la conférence : lundi 12 novembre 2018 (Les Salons de l'Hôtel de France à Versailles). Traditionally, structural biologists approach cellular complexity in a reductionist manner by characterizing isolated and purified molecular components. This 'divide and conquer' approach has been highly successful, as evidenced by the impressive number of entries in the PDB. However, awareness has grown in recent years that only rarely can biological functions be attributed to individual macromolecules. Most cellular functions arise from their acting in concert. Hence there is a need for methods developments enabling studies performed in situ, i.e. in unperturbed cellular environments. Sensu stricto the term 'structural biology in situ' should apply only to a scenario in which the cellular environment is preserved in its entirety. Cryo-electron tomography has unique potential to study the supramolecular architecture or 'molecular sociology' of cells. It combines the best structural preservation that is physically possible to achieve with the power of three-dimensional high resolution imaging. G Protein-Coupled Receptors (GPCRs) are versatile cellular gatekeepers that regulate the majority of physiological processes in the human body and have been targeted by a large share of pharmaceutical drugs. Structural studies of GPCR superfamily have been enabled a decade ago by multiple breakthroughs in technology that included receptor stabilization, crystallization in a membrane environment, and microcrystallography. The recent emergence of X-ray free electron lasers (XFELs) has further accelerated structural studies of GPCRs and other challenging macromolecules by overcoming radiation damage and providing access to high-resolution room temperature structures and dynamics using micrometer-sized crystals. 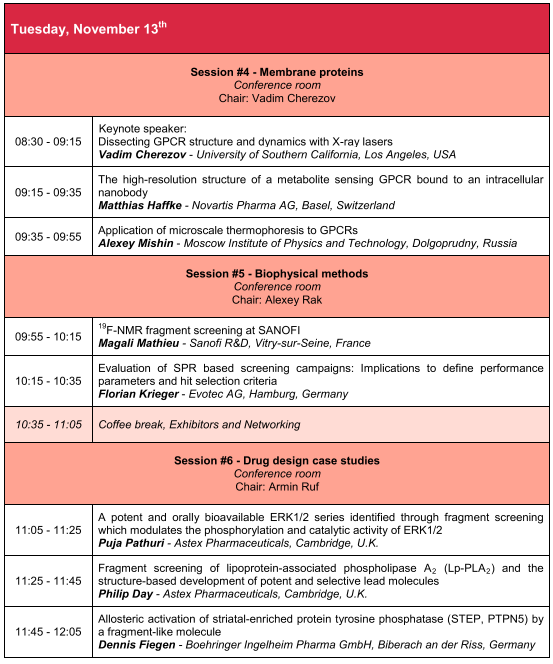 This talk will summarize key technology advancements and major milestones of GPCR research at XFELs, and provide a brief outlook on future developments in the field. Many of the world’s top selling drugs target G protein-coupled receptors (GPCRs). The past ten years have seen an exponential increase in structural knowledge for this important and clinically relevant superfamily of membrane proteins as a result of pioneering protein engineering techniques from multiple groups globally. This, coupled to advances in crystallization methodogolies per se, serial crystallographic techniques such as XFEL, cryo-electron microscopy and microfocus collection techniques using conventional synchrotron radiation, has not only driven structure based drug design (SBDD) at the orthosteric site(s) of clinically relevant targets, but also uncovered a myriad of allosteric sites that may also be targeted to modulate GCPR activity across all subclasses of this superfamily encompassing a wide range of indications. 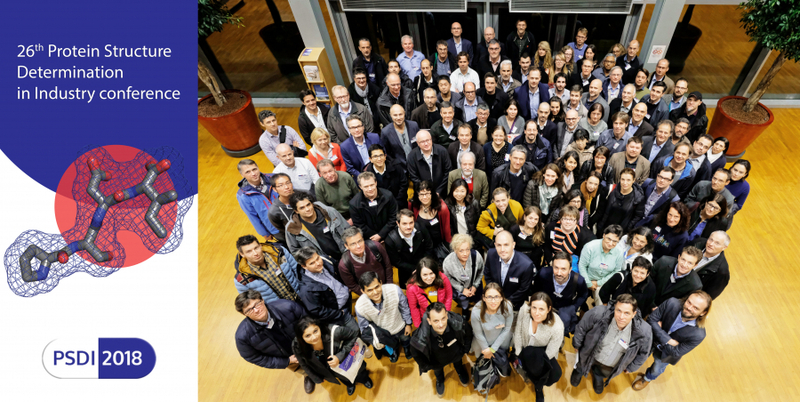 As a number of NCE’s developed at Heptares have entered man, the impact of the last decade of research is reaching a breakthrough point with exciting results. Growing crystals of complex human proteins for structure determination by X-ray crystallography is always challenging. This is especially the case for integral membrane proteins, yet it remains a vital part of the drug development process. While the use of many alternative screens is well established, the vast majority of trials are still carried out using vapour diffusion methods. Changing the method used for crystal growth can open up completely new areas of the phase diagram and significantly improve your chances of crystallisation. We will demonstrate the use of Laminex sandwich plates and DiffraX in situ plates, as popularly chosen for sponge phase crystallisation of membrane proteins but also for soluble proteins in applications such as serial crystallography. 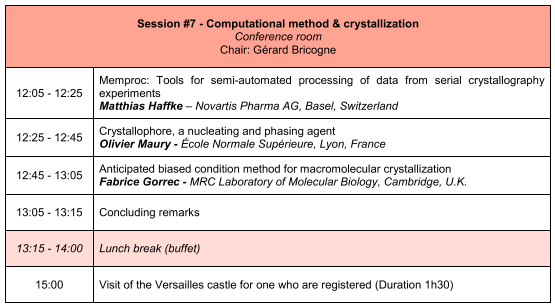 In addition, we will demonstrate the Crystal Former plate for microdiffusion crystallisation, which allows you to access a broad range of conditions while using smaller volumes of sample. Even where crystals of the most challenging proteins can be grown, they are often difficult to spot when scanning plates, because they are below 10 µm in size, or obscured by aggregate or precipitate. Where the conditions necessary to grow the crystals are complex, it can also be difficult to determine whether crystals are of macromolecular or inorganic origin. Use of UV-imaging and plane polarising light with the UVEX fluorescence imaging system can considerably simplify this process, ensuring you do not miss a hit condition. 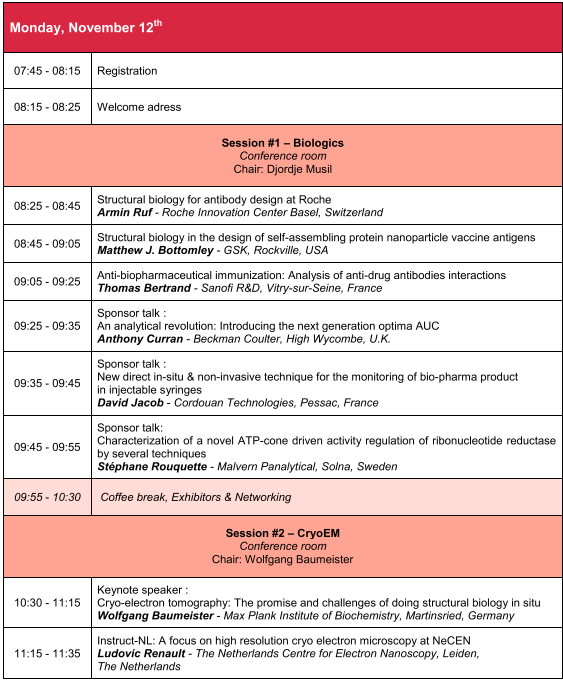 Purpose of the Workshop: The work shop will discuss strategies and technologies for drug discovery programs aiming for innovative inhibition modes, such as allosteric, PPI inhibition, covalent and extended residence time. Previously, the drug mode-of-action for enzymatic protein targets was aimed at the catalytic center for substrate competition. Meanwhile, alternative modes of inhibitions are applied to address typical inhibitor challenges such as selectivity, efficacy and resistance formation. Less conserved interaction sites are now targeted by the means of allosteric inhibitors, which are also independent from high cellular substrate concentrations. Protein-protein-interaction inhibitors are generated that block the complex formation between the target proteins and the associated functional proteins. In addition inhibitor residence time, together with kinetic selectivity, became an important optimization parameter so that inhibitors selective for distinct activation states of enzymes can be engineered. Further on, covalent inhibitors are designed to attack specific residues within the target protein. Such recent drug discovery advancements require fundamental changes in the pool of appropriate assays, biophysics and screening tool boxes and implementation. Proteros biostructures has established stand-alone and integrated discovery service solutions that combine biochemistry with innovative biophysics and protein crystallography to facilitate both, efficient and data driven generation of innovative novel inhibitors. The Proteros drug discovery services platform enables to screen specifically for allosteric inhibitors. Assays are established to identify compounds blocking relevant protein-protein interactions. Proteros’ high throughput binding assays allow screening for inhibitors addressing non-activated enzyme states. Proteros’ high throughput kinetic profiling provides knowledge about both binding affinity and binding kinetics against on- and off-kinase targets for all involved compounds to facilitate the rapid generation of residence time optimized inhibitors. Methods are in place that de-convolute the binding of covalent inhibitors into a) non-covalent and b) covalent contribution to escape resistance formation. Whereas protein crystallography discloses different binding modes and enables medicinal chemistry to improve the inhibitor properties. The workshop demonstrates the application and synergistic use of such different discovery service technologies for an efficient integrated drug discovery process towards innovative inhibitors. This would survey the new instrumental resources and the associated software developments all the way down the proverbial pipeline, and analyse their transition from high-end tools for structural biology projects towards industrial services of potential interest to the pharmaceutical sector. 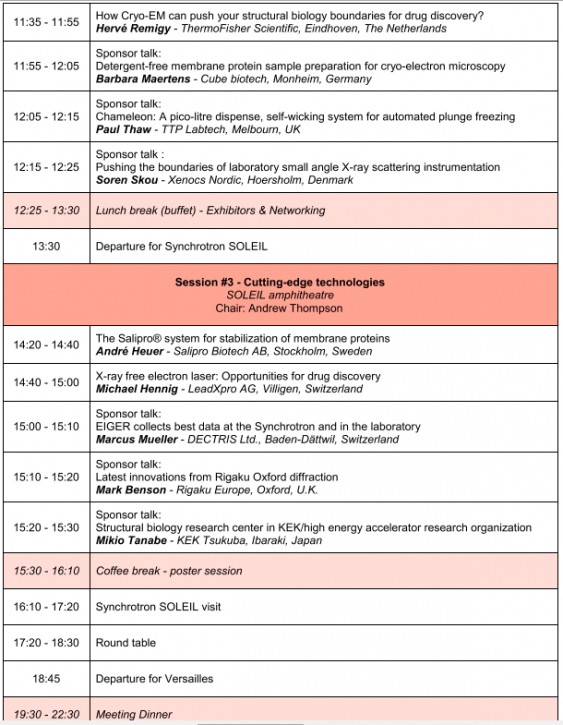 I would invite contributors from Big Pharma, CROs and synchrotrons, and encourage discussion of what hurdles need to be overcome to fully exploit these new resources for the purposes of drug discovery. I see this as an opportunity to respond to the current enthusiasm for cryo-EM by showing how dynamic X-ray crystallography itself continues to be, even if more discreetly than its young sibling. Starting with material of questionable quality for protein purification and characterization leads to irreproducible or ambiguous results. Methods such as chromatography while widely used, can also derail experiments—due to the amount of time and expertise required to perform these techniques. We will present a new platform, the Tycho NT.6®, that swiftly identifies sample quality and relative functionality in minutes complementing and guiding purification and characterization workflows—making experimental decisions easy and quick—saving time, effort and cost downstream. This workshop will also give you the opportunity to see real live sample-set on our new device, Tycho NT.6®. How easy-of-use it is and its value for QC in various drug discovery operations. You will be informed about the selection results from the Scientific Committee. Saturday November, 10th : 173,30 € (including V.A.T) per night (including breakfast and tourist tax, 2,30 € (including V.A.T) per person. Tuesday November, 13th : 199,61 € (including V.A.T) per night (including breakfast and tourist tax, 2,30 € (including V.A.T) per person. Please book additional night(s) when you register online. Official residence of the Kings of France, the Palace of Versailles and its gardens are among the most famous world heritage monuments and constitute the most complete realization of French art of the 17th century. During guided tours, a speaker from the Palace invites you into lesser know locations otherwise closed to the visitors. After the visits, access to the main circuits, the King's state apartments, the Hall of Mirrors, the Ladies'apartments and the exhibitions are available for free. The price of the visit is 25,00 € (including V.A.T) per person. Beginning at 3 p.m - duration 1h30 (group of 18-20 persons). If you are interested in visiting the Versailles Palace, please register for the visit online. PLEASE NOTE : Order forms are not accepted - Your registration will be definitive as soon as your payment will be received. Would you please write it out to “Synchrotron SOLEIL” and write at the verso the following reference: PSDI 2018 / 69170601. The commercial exhibition is a traditional and essential part of the Protein Structure Determination in Industry (PSDI) meetings and will be located in the hotel during the 2018 conference. Tea and coffee breaks will be taken exclusively in the Exhibition areas. The commercial exhibition will run for the duration of the meeting, from the morning of Monday 12th November 2018 at 09:30 until the close of the meeting at 14:00 on Tuesday 13th November. 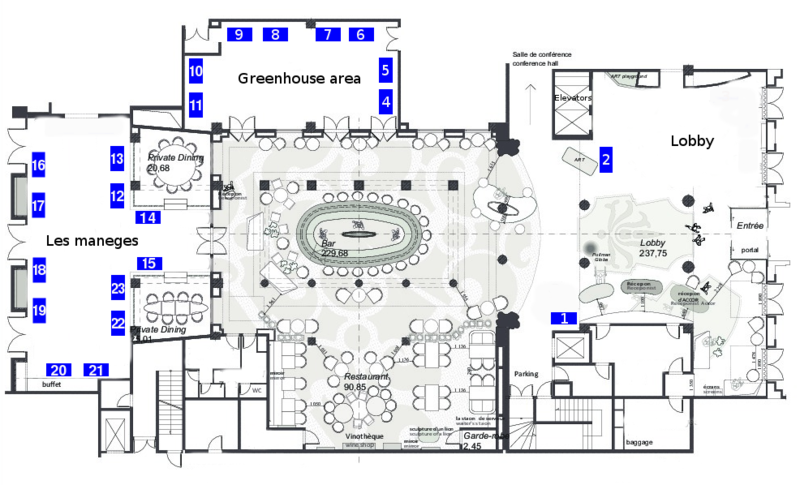 Exhibition spaces are located in two rooms called “Green House” and “Les manèges”, as well as in the "Lobby". The exhibition spaces provided are approximately 2,5m x 2m and will include a table 180 x 45cm, 2 chairs and a power socket. If you have any specific requirements outside of these criteria (for example poster board) please contact the organizers. We have made a preliminary schedule for 23 booths: 10 booths in the “Green House”, 10 booths in the “Les manèges” and 3 booths in the "Lobby" (please see plan and pictures below). The floor plan will be established by the organizers: we will make every effort to respect requests for booths in specific locations, but this will not always be possible. Exhibition space does not include the meeting registration fee. All exhibitor delegates must register individually for the meeting. We recommend that all exhibitors take out relevant insurance cover for any equipment. Please do not forget to mention the sender name/company and mark any deliveries with “PSDI2018”. “Green house” exhibition area (10 exhibition spaces) will be available for set up from 17:00 on Sunday 11th November and also Monday 12th 8:00 to 9:30. “Les manèges” exhibition area (10 exhibition spaces) and the "Lobby" will be available for set up only on Monday 12th November 8:00 to 9:30. When you register for stand, please mention the exhibition area you prefer. Please note that the deadline for removal of exhibition equipment is 14:00 on Tuesday 13th November. Exhibitors failing to comply will be responsible for any financial penalties incurred. ny additional storage space for equipment prior to collection must be arranged in advance with the hotel’s contact person - Anne SADIEN (Tel: + 33(0)1 39 07 46 50 - Mail: h1300-sb1@accor.com). Exhibitors will have the opportunity to give short presentations to delegates during a dedicated session. The number of slots is likely to be limited to a maximum of 10, and presentations will be allocated on a first come first served basis. Timing will be strictly enforced (10 minutes). Each presenter will be permitted to submit an abstract for his presentation to be placed in the abstract book (approximately 300 words). It is the vendor’s responsibility to ensure that these are submitted to the event organizers within the deadline for publication (deadline to be supplied). We will acknowledge all exhibitor sponsorship through a color page in the abstract book listing all exhibitors’ logos (high resolution JPEG or EPS logo to be supplied to the event organizers). These will also be placed on the conference web site on the front page. Appropriate acknowledgement will be made for each item sponsored. Sponsors will have the opportunity, this year, to host a half-day workshop on Sunday afternoon 11th of November. Versailles is a French commune located in the department of Yvelines, in the region Ile-de-France, known worldwide for its famous castle as well as for its gardens, sites classified under the aegis of UNESCO in the list of world heritage of humanity. A new city, created by the will of King Louis XIV, it was the seat of French political power for a century, from 1682 to 1789, before becoming the cradle of the French Revolution. Versailles is also historically known to have been the site of many treaties, such as the Treaty of Paris (1783), which ended the American War of Independence and the Treaty of Versailles signed after the end of the First World War. The city of Versailles is located in the western suburbs of the French capital, 17.1 km from the center of Paris. Deputies and Senators meet there in congress at the castle, to ratify any modification of the constitution. Headquarters of Versailles-Saint-Quentin University (UVSQ) and welcoming many companies, the city is part of the Paris-Saclay technological cluster project. Please visit the website of the tourist office of Versailles website for more information on what to do during your stay in the city. 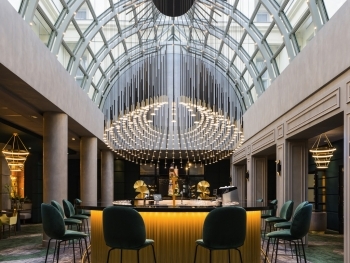 The Louis Versailles Chateau - MGallery by Sofitel is a 4-star establishment of the Sofitel chain, completely renovated in 2017. It is ideally located to get to the residence of the Sun King, with only 500 meters separate the Palace of Versailles from the hotel (5 minutes by foot). We find then rooms in a purely Versailles style and high-end services. The property is a 2-minute walk from Versailles-Château-Rive-Gauche RER Station, providing direct access to central Paris, the Eiffel Tower and Avenue Champs Elysées. The meeting will take place Sunday 11th to Tuesday 13th November, 2018, at Le Louis Versailles Château. The Louis Versailles is in the heart of Versailles and provides easy access to the city. It is a short walk from the Palace of Versailles and close to the Coach Museum, the Versailles Conservatory and the Cathedral Saint-Louis of Versailles. The hotel is an ideal base for exploring the city. It is 240 m from the Versailles Chantier - Rives Gauches (RER C) station which serves Paris in 26 minutes. The hotel is a 26 minutes drive from Orly Airport and a 48 minutes drive from Roissy Charles de Gaulle Airport. From Paris, take the A13 motorway, exit Versailles Château. From Orly, take the N186 then the A86 towards Versailles. From Roissy Charles de Gaulle, take the A1 (E15, E19), then the west ring road then the A13 and exit at Versailles Château. Between 68€ and 101€ from / to Roissy Charles de Gaulle airport, depending on the traffic. The journey generally takes around 1 hour. Versailles has good public transport links to Paris. From central Paris: RER C towards Versailles-Rive-Gauche-Château (5 mins walk from the Palace). From Paris Montparnasse, SNCF trains stop at Versailles-Chantiers station (20 mins walk from the Palace). From Paris Saint-Lazare, SNCF train to Versailles-Rive-Droite (15 mins walk from the Palace). NB: métro tickets are not valid for these journeys! You must purchase Ile-de-France tickets for Versailles-Rive-Gauche-Château, Versailles-Rive-Droite or Versailles-Chantiers. It is better to buy return tickets – that way you avoid queuing to buy your ticket on the way back!